Who are the Sunrockers? The truth is that there is no such person as an “average Sunrocker.” They come from all walks of life and are of all ages from 50 to 92 (!) There are rich ones, poor ones, fat ones, thin ones, tall ones, small ones, ex professionals and ex working class sunrockers. The one thing that they do all have is a belief in the central/core values of Sun Park Living. There are (ex) salesmen, bankers, accountants, warehouse managers, hairdressers, a deep sea fisherman, Andy from the merchant navy, policemen, IT professionals, a photographer, nurses, a school caretaker, a social worker, electrical goods retailers etc etc. They all believe in the concept of the community and treat fellow sunrockers at the village with respect and tolerance. Mike and Sue Jones. This couple have a lifestyle business in the UK – a Guest House in Bournemouth that is appropriately called SunHaven. Mike and Sue have worked tirelessly to build up the community and have given generously and abundantly of their time and skills. 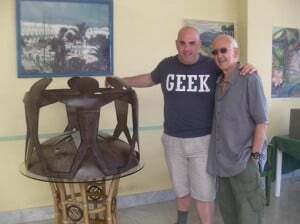 Terry Richards is pictured above with a sculpture he created whilst he was first at Sun Park. He kindly donated it to the community. Terry lives in Cheltenham and has a studio nearby where he works as a full time contemporary sculptor. He creates unique original sculptures, exploring emotion and embodying reflections on the elements, nature, movement, mood and passion. The immense power of the elements and the science of universal wave impulses that transfer energy and stimulate emotions have a strong influence on his work. Terry creates contemporary pieces using unusual combinations of materials and processes. Tony is a professional artist who oversaw the painting of the murals that adorn the cinema, bar and common areas. He helped people who had never seen an easel become competent in a very short period of time.